Asmodee and Heidelberger Spieleverlag are proud to announce their merger. Since both publishers have worked closely together in logistics since August 2015, this merger is the ideal step to further expand the joint success. Through the merger, the respective strengths of both companies in marketing, events, sales, service and logistics can be excellently combined and further improved. The range of products from both companies also complement each other perfectly, allowing customers to offer an even wider range of games. Dixit, Codenames, Zombicide, X-Wing, and new hits like Star Wars: Destiny, Final Fantasy Trading Card Game, and Runewars are now coming from a single house. "I am very pleased that Heidelberger Spieleverlag is now part of the Asmodee family," says Carol Rapp, Managing Director of Asmodee Deutschland. "As a result of the merger, Asmodee not only gets fantastic new games but also great new colleagues. Both of these factors will help us to exceed the success of the last few years. " "We are starting together in a future that is profitable for all," says Petra Hofstetter, Managing Director of Heidelberger Spieleverlag. "Not only both publishers, including our employees, but also our partners and especially our customers will benefit from the great experience and strengths of both sides." Heidelberger Spieleverlag will remain at the Walldürn location, and as Studio Heidelberger will develop outstanding games under the renowned logo of the bear and continue the localization of the FFG games. The logistics and the warehouse will continue as before and offer the usual fast service. The combined company will be managed as Asmodee GmbH, and Carol Rapp will continue to function as managing director of the company. 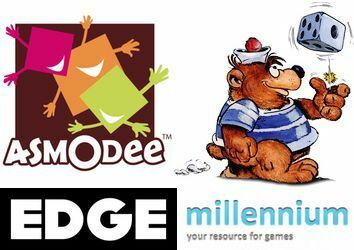 The Asmodee Group announced today its acquisition of Heidelberger Spieleverlag, EDGE Entertainment and Millennium, German, French and Spanish board game distributors and publishers. The Asmodee Group is present in Germany since 2008 with a local distribution business unit. The synergy between Asmodee's expertise in the broad market and Heidelberger's historic link with the hobby shops will make of this new entity one of the leading actors of the German board game across all channels. This acquisition is the natural next step of a partnership initiated in 2015 when Asmodee and Heidelberger started distributing each other's catalogue in their respective sales channels. Founded in 1999, EDGE Entertainment is a board game publisher with presence in Sevilla (SP) and Toulouse (FR). Amongst other games, EDGE holds the rights to the Citadels game in French and Spanish and has been a long-standing partner of the Asmodee Group studio Fantasy Flight Games. EDGE will continue developing new games. Gilles Garnier, co-founder of EDGE Entertainment, is appointed head of EDGE. Millennium is a Spanish board game distributor specialized in hobby games and retail channels. The Asmodee Group is present in Spain since 2008 with a local distribution business unit. The synergy between Asmodee's expertise in the broad market and Millennium's historic link with the hobby shops will make of this new entity one of the leading actors of the Spanish board game distribution across all channels. Jose Manuel Rey CEO of Millennium and co-founder of EDGE Entertainment is appointed head of Asmodee Iberica. "We are delighted to integrate three great board game companies with the acquisition of Heidelberger, EDGE and Millennium. Throughout the past years they have demonstrated high skills in terms of game publishing and distribution that will now strengthen our position in France, Germany and Spain, that are key local markets." said Stéphane Carville CEO of Asmodee Group. "Joining forces with Asmodee, we are building a strong catalogue, an efficient offer of service and support for the broadest audience. We are very happy and are looking forward to the exchange of expertise and knowledge from both sides," said Petra Hofstetter, manager of Heidelberg Spieleverlag. "In Spain, Asmodee and Millennium are complementary both in terms of catalogue and access to retail channels. I am very proud to have the opportunity to lead this combined entity," said José Manuel Rey, CEO of Millennium. "EDGE is a studio that has a natural place in the Asmodee Group. We have been long-time business partners of Asmodee studios like Fantasy Flight Games and will continue developing new games within the Group," said Gilles Garnier, co-founder of EDGE Entertainment. So now Asmodee has followed through with the acquisition of those publishing and distribution partners, which makes sense given their long-standing relationships. Why continue the dance externally when you can marry your partners and bring them even closer? I imagine the next question for many people is not what Asmodee will acquire next, but whether the company is now large enough to attract the attention of Hasbro or Mattel. Maybe so, but I'll wager that being acquired is the goal of neither the Asmodee Group nor Eurazeo. Yes, Eurazeo is an investment company that wants a return on its investment, but it's already getting that return in spades, noting on its website that Asmodee's revenues in 2015 rose 55% over the previous year, with its EBITDA rising 92%. That figure will only continue to rise in the coming years, not simply due to the acquisitions that put more money directly under its belt, but due to the continued growth of the hobby game industry as a whole and the increased presence of hobby games in the mainstream market. I'm not saying that a quarter-million people started playing hobby games this year and all joined BGG; rather I'm noting the growth of those who care enough about categorizing themselves as gamers to join a site like BGG. Hundreds of thousands more people who play games still don't know about BGG or about modern hobby games in general. That market of gamers is what the Asmodee Group is aiming for, and with the studios and licenses under their belts, you'll likely see Ticket to Tatooine and Carcassonne: Game of Thrones and other such titles come to market in the near future to continue to push their expansion into mainstream markets such as Target and Walmart. Hobby games are already normalized this way in Germany, appearing in many department stores, but the room for growth is still huge in the U.S. and elsewhere and the Asmodee Group thinks it can capitalize on that growth for many years to come.